Noosa was once again enlivened by the Food and Wine Festival from 17-20 May 2018. The program included a festival village in the heart of town and an indulgent array of events, showcasing and celebrating everything food and wine. In recent years the event has passed through a number of changes in ownership and management and is now owned and operated by Tourism Noosa, the region’s non-profit tourism body. We caught up with Festival Director, Alesha Gooderham to talk about the event and what it means for Noosa, its visitors and community. What has you most excited about this year’s festival program? This year we have introduced a Chefs Skill Table in the Producers Pavilion. This is based on the idea of tours to Italy that let you spend time with local families to learn traditional and participate in traditional recipes. So we are replicating this with chefs and you get to be right there next to the chef, able to ask questions as they prepare meals. This is free of charge as part of the festival ticket. There’s real emerging interest now in craft beers and cider so this year we have introduced the Craft Beer and Cider Corner. We’ll have Stone and Wood, Four Pines, Balter Brewery and Eumundi Brewery – a mix of national and local brands which is fabulous. This year we are supporting the work of Oz Harvest that aims to reduce food waste while providing affordable food to disadvantaged people in our communities. We have the Bistro C Big Breakfast aiming to make breakfast for 500 people with odd shaped eggs that would have otherwise been discarded, with profits to Oz Harvest. Through our alignment with Oz Harvest, other local food businesses are supporting them and if not for the festival that may not have happened. So it’s great to see broader social benefits of less food waste and positive Impacts on our community. I love that this year we have themed our Master Classes depending on the time of the day. So our morning classes will start with a Padre Coffee and our early evening classes include a Gin in the afternoon, well, just because we can. And for a bit of fun let’s not forget the Pims Garden Party we have planned at the centre of the village to coincides with Prince Harry’s wedding! Why has it been so important for Tourism Noosa to take over management of the event? We decided that we needed to be hands on to take the festival forward with new fresh energy and enterprise. Because the event is now ‘owned’ by the whole of Noosa, and not one entity, we have the passionate involvement of the whole local food and wine industry. Our stakeholders know that any profits from this year’s event will be re-invested next near. This creates such a strong sense of engagement and goodwill. On the books, our festival team only has 2 people, but because of the community support and network we have, I feel we are a team of 50-people strong! Why is the event so important for Noosa? According to our research, the second reason people come to Noosa after the natural environment is the food and wine. So while the macro benefits to our destination with more visitors and visitor awareness are clear, subtler benefits to our food and wine industry are starting to emerge. I asked all of Noosa’s restaurants to come together to plan the event. This has generated an ongoing discussion with Noosa restaurants, creating spin off events and dialogue within the F&W industry. We are now seeing a collective approach to constantly enriching the Noosa food and wine product and improving on what we offer as a destination, which is part of our Tourism Noosa ethos. For example, one of the things we didn’t just do was go and find the guest chefs ourselves. Rather, we asked our restaurants who they wanted to work with, so we could build on existing relationships. As a result, we now have our young talent able to work alongside nationally and internally recognised chefs in programs planned with their input. Ultimately we want them to have fulfilling careers here rather than moving to Sydney or Melbourne permanently to further their careers. How does this event differ from other food and wine festivals around the country? This is definitely not a road-show event and so much about the festival is unique to our region. We’ve curated a bespoke program unique to this region, developed around individual and collective talent and ideas. It’s a boutique, artisan festival to showcase the breath of restaurant experiences that we have here considering our small geographical foot foot-print. There is such an amazing array of options for quality, taste and price point. We have everything from: a degustation experience at Wasabi, a pinnacle culinary experiences nationally; to Bombetta at Noosa Junction for another level of experience; to Locale on Hastings Street; or, to our beachside restaurants so unique to Noosa like Bistro C and so much in-between. There’s a real energy because there’s just so many exciting things happening in food and wine in Noosa and a sense that people want to get involved. So why should our guests have the NFWF on their bucket list? I think it’s about experiencing a food and wine event that is totally unique to our region while bringing in iconic national talent. Even if a festival event associated with a local restaurant might be sold out, people can still experience that restaurant either during the festival or 365 days of the year. And how fortunate are we to have to host a festival in Noosa? We can’t lose site of the fact we are bringing all these fabulous brands and chefs together, but seriously, look at our backdrop! You can enjoy a day at the festival village, take a master class or enjoy dinner at one of our fabulous restaurants and be up for a swim in the morning before doing it all again. It’s all just so deliciously perfect! Add the Noosa Food and Wine Festival to your list of must-do experiences. This year events will be staged across multiple locations from 17-20 May. 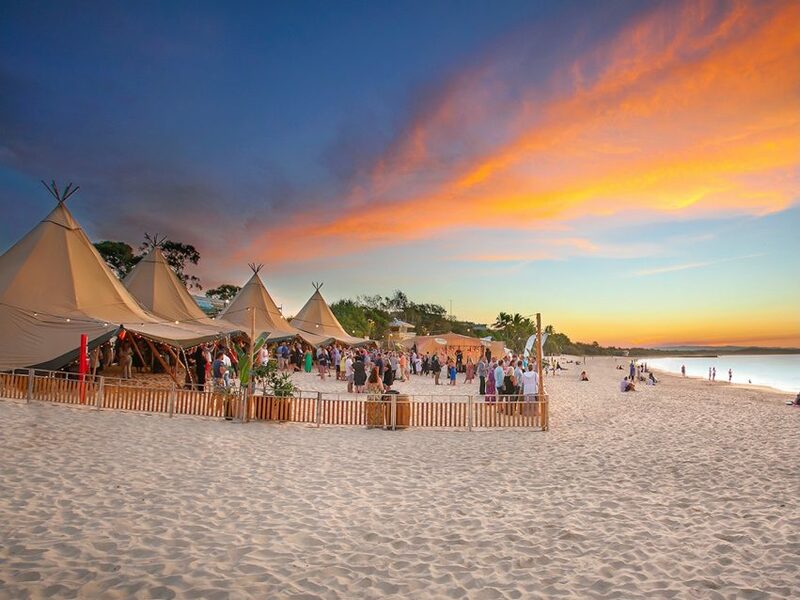 Signature events include the Tipis on Noosa Main Beach, the Long Lunch on Hastings Street, Hinterland Food Trails, events in Noosa’s best restaurants and an exciting Festival Village.